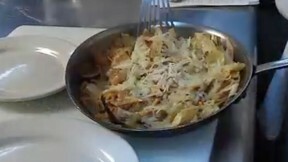 Chilaquiles, or tortilla casserole, is a traditional Mexican dish usually served during breakfast or brunch, although it can be eaten at any time of day. Lightly fried corn tortillas are simmered in a green or red salsa and topped with cheese and/or pulled chicken to create a perfectly simple morning meal. Many regional variations of this dish exist so feel free to add your own twist to this delicious Mexican tradition! Rip the tortillas into small pieces and place them in a pan coated in olive oil. Turn them over so they don’t get too toasted and add salt. Add salsa verde or roja (see previous recipe) and let simmer for 2-3 minutes, mixing so that the tortillas are coated in salsa. Add cheese and shredded chicken, if desired. Add some water to the pan to deglaze it and to thin out the sauce, otherwise the tortillas will get too dry.